It’s Valentine’s Day — a perfect time to turn to Love Field (…which, like “Lovers Lane,” must sound a little cutesy to outsiders). The above image shows the letterhead of the U.S. Army Air Service Flying School Detachment, a consolidation of World War I squadrons based at Love Field from November 1918 to November 1919. 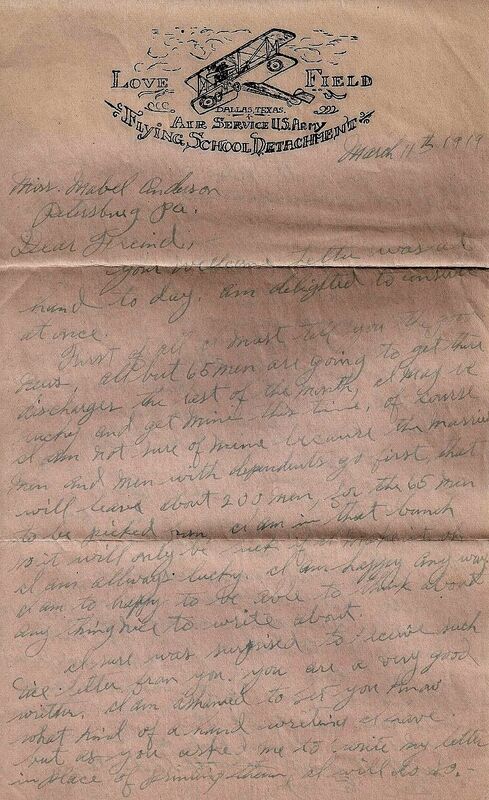 This is an item for sale on eBay, and only the first page is scanned, so the identity of the author of the letter will remain unknown to those of us merely browsing an auction listing, interested but unwilling to cough up the cash to buy it and read any further. I wonder what happened? If he wanted to meet her, then perhaps he, too, was from Pennsylvania — they might have met when he arrived back home. He certainly sounds excited and hopeful and flirtatious, and he should, because not only was he “allways lucky,” but the long war had finally ended and he was headed home with his whole life ahead of him. Where’s Paul Harvey to tell us the rest of the story? Here is the first page, with a transcription (spelling corrected) below (click to see a larger image). Your welcome letter was at hand today. Am delighted to answer at once. First of all I must tell you the good news. All but 65 men are going to get their discharges the last of the month. I may be lucky and get mine this time. Of course I am not sure of mine because the married men and men with dependents go first. That will leave about 200 men, for the 65 men to be picked from. I am in that bunch, so it will only be luck if I make it ok. I am always lucky. I am happy anyway. I am too happy to be able to think about anything nice to write about. I sure was surprised to receive such a nice letter from you. You are a very good writer. I am ashamed to let you know what kind of a handwriting I have, but as you asked me to write my letter in place of printing [it], I will do so. 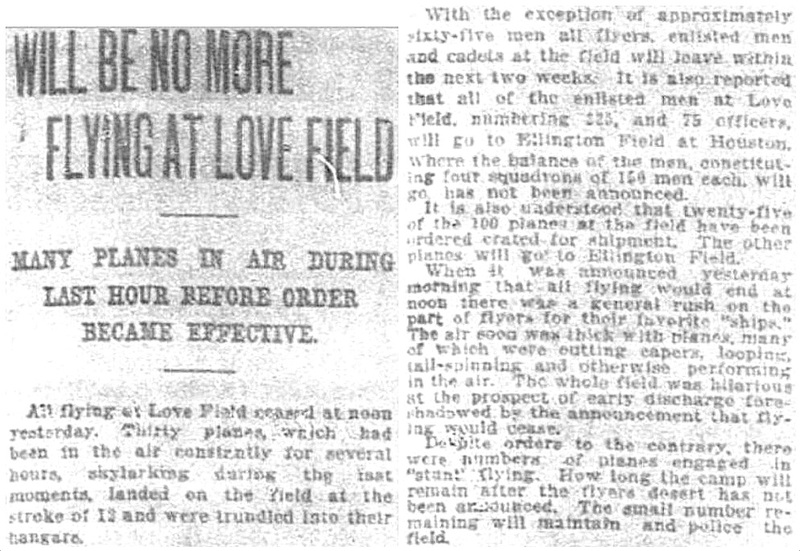 Here are two stories about how the airmen stationed at Love Field responded to the announcement that all flying would cease at noon on March 10, 1919 before demobilization began. It sounds like something from a movie: a sky full of something like 30 airplanes looping and “skylarking,” their pilots celebrating their fast-approaching military discharge by flying their favorite “machines” for the last time.